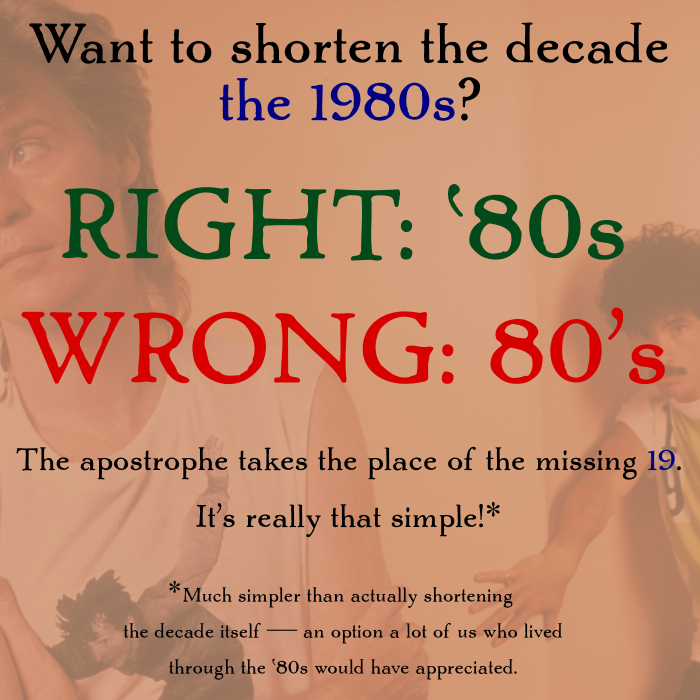 Ever wonder how to use apostrophes in decades? I bring it up because I see apostrophe abuse way too much and I’ve decided that enough is enough! Actually, enough is too much, but I’m not going to let it bug me into the ’20s. C’mon, guys. If you run a Facebook group or a club or a record label or a publishing house or create a Spotify playlist that specializes in decades, please understand why the apostrophe you’re putting in your titles, headlines, and advertising exists. If you’re omitting the 19 from 1980s, for instance, you put the apostrophe in place of the omitted “19.” So it’s ’80s, not 80’s. Simple as that! I’m not trying to be pedantic, but I’ve sat on the sidelines for too long. If you’re wrong, you’re wrong, and if you’re writing 80’s (or 90’s, or whatever), then you’re wrong. As wrong as the misguided family grocer who proclaims to the world that apple’s and orange’s are 3 for 1$ on the sign in front of his shop. It’s ’80s. Or ’90s. Or ’20s. Or whatever. Take those examples and run with them. Above all: please stop being wrong! Hey! My name’s Binky Rudich, and I’m running a club that specializes in the decade known as the 1980s! It’ll be a hoot! But I’m going to shorten it to ’80s, because I don’t feel like typing out the whole thing each and every time, and most people will understand that I’m talking about the 1980s rather than the 1880s or the 2080s! That “19” or “18” or “20” seems superfluous; you feel me? Yes! We do feel you. And we appreciate that you understand why the apostrophe goes in front of the ’80s rather than awkwardly toward the end. If you’re talking about the 1980s and you want to shorten it, you mean to mention the ’80s, not the 80’s. The apostrophe is meant to stand in for the missing “19.” It’s as simple as that. If you don’t get it, then you’re overthinking it. I get the apostrophe for what’s missing, but what is confusing is the possessive part. Like Kinko’s… Could maybe the ’80s own the night? And can you have two apostrophes in the same word? No. You could NOT say something like “The ’80s’ worst musical legacy was Journey.” because that’s not even wrong. You can’t tell me Don’t Stop Believin’ doesn’t stir you in some small way. I was listening to Slapshot, the Misfits, and Agnostic Front but still got goosebumps at Separate Ways. End Rant. I agree 100% with the “that’s not even wrong” assessment! Bob, who are these plebs that don’t know how to use apostrophes? Are they the same ones that say things like /face palm or /flips table? /me flips facepalm over table!